Girls’ Brigade in Northern Ireland is one of the largest youth organisations in Northern Ireland, and part of Girls’ Brigade Europe. Enough sweets/chocolates to share with your group, pre-printed stickers of scripture passages, sticky tape, facility to play music, wrapping paper. Create a multi – layered parcel with the prize (sweets or chocolates) in the centre that people will enjoy. In each layer, include some verses of praise and adoration from the psalms. Play music and pass the parcel round. When the music stops, the next wrapper is removed and reveals a verse from a psalm. This is read out to the rest of the group. 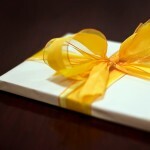 When the prize is revealed, have a message written on it, encouraging the winner to share it with the rest of the group.